Lot 163: Emma Amos, Let Me Off Uptown, oil & photo transfer on canvas with metallic paint, glitter, collage and African fabric boarders, 1999-2000. 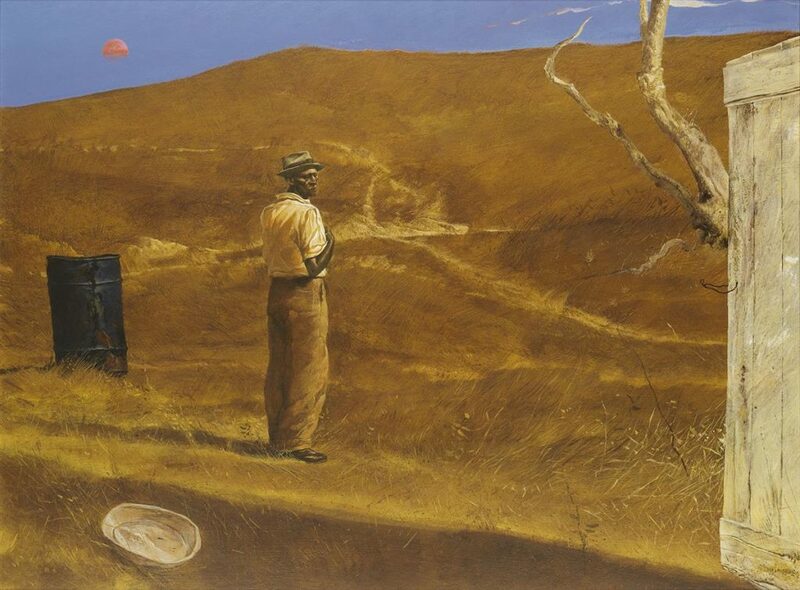 Sold for $125,000, a record for the artist at the time of auction. The sale set twelve auction records and delivered successful auction debuts. Contemporary artists stood out, claiming six of the top prices in the sale, including Emma Amos, Simone Leigh and Howardena Pindell, who established new auction records. Lot 171: Simone Leigh, Untitled, salt-fired stoneware, 2006. Sold for $93,750, a record fo the artist at the time of auction. 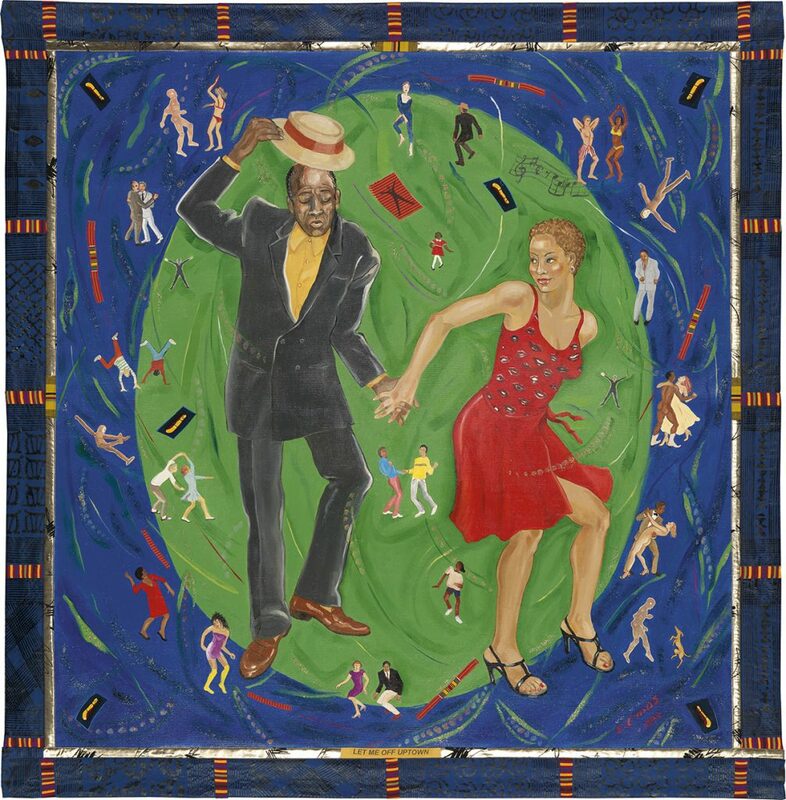 Amos’s painting on fabric Let Me Off Uptown, 1999-2000, exceeded her previous auction record of $40,000, selling for $125,000; Hugo Boss Prize recipient Leigh garnered a record with a 2006 salt-fired stoneware vessel at $93,750; and Pindell’s 1980-81 mixed-media on paper collage, utilizing her signature hole-punched circles, reached $47,500. Lot 134: Faith Ringgold, Sleeping: Lover’s Quilt #2, acrylic on canvas & pieced tie dyed and printed fabrics, 1986. Sold for $221,000. Also of note was Faith Ringgold’s Sleeping: Lover’s Quilt #2, 1986, an example of the artist’s story quilts, which brought $221,000. 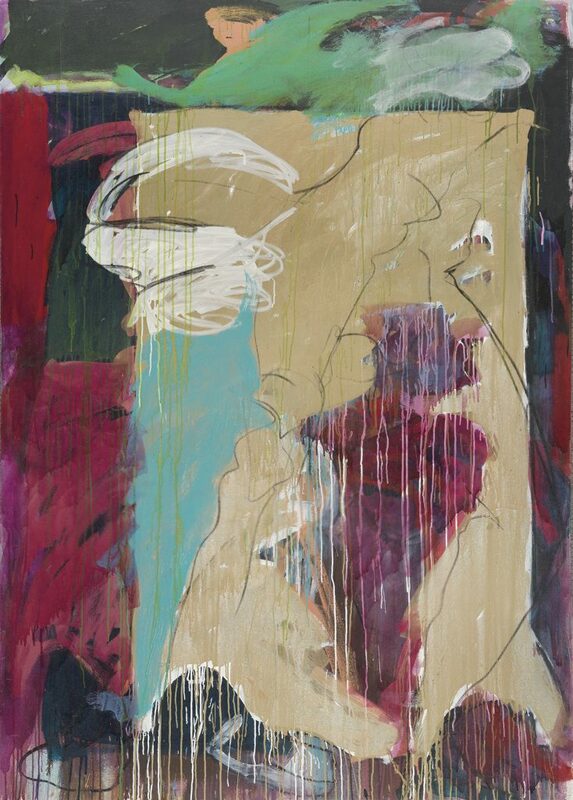 Artists experimenting in color brought top prices, including Frank Bowling with In M. of M.W. 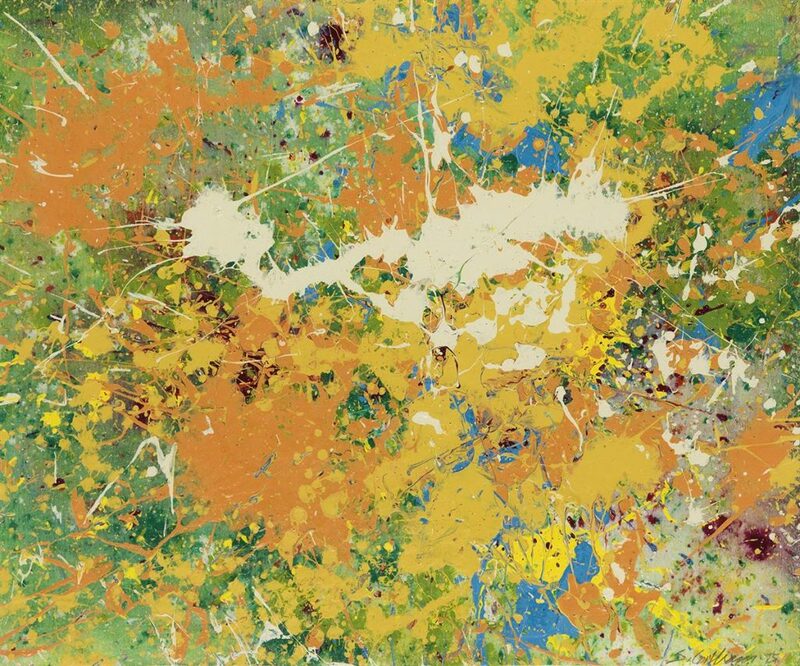 III, 1980, an example of his poured painting series ($118,750). Lot 115: Sam Gilliam, Onion Skin III, acrylic on paper, 1975. Sold for $50,000. Sam Gilliam, with the 1975 work on paper Onion Skin III ($50,000), Longing, 1993, an acrylic and polypropylene example of his raking technique ($81,250) as well as Snow Lane #22, 1996, acrylic and mixed-media paper collage, ($52,500). Lot 105: Norman Lewis, Block Island, oil on canvas, 1973-75. Sold for $389,000. Norman Lewis led the sale with the 1973-75 oil on canvas Block Island, an impressive example of the artist’s 1970’s period inspired by his summers on the island, which brought $389,000. 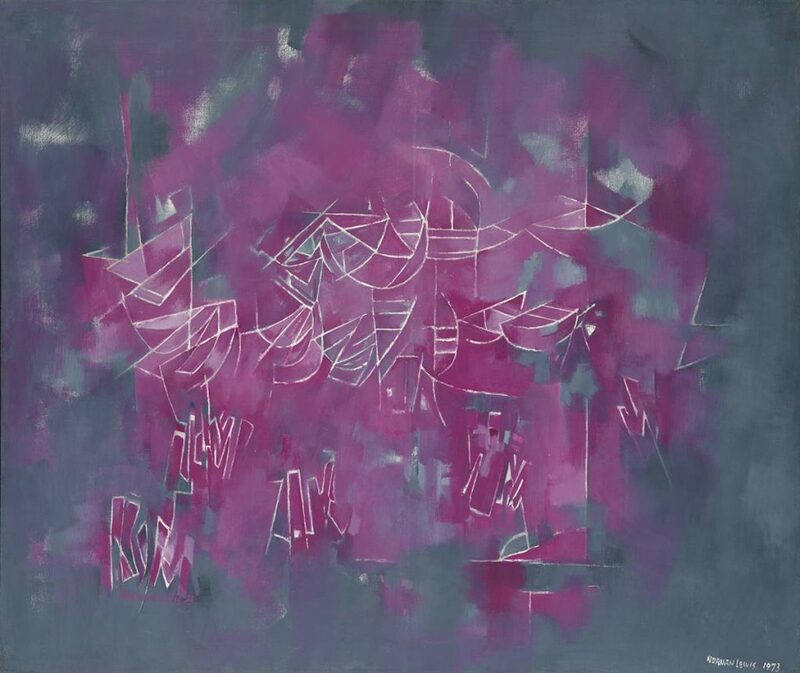 Lot 30: Norman Lewis, Shapes, oil on board, 1947. Sold for $70,000. 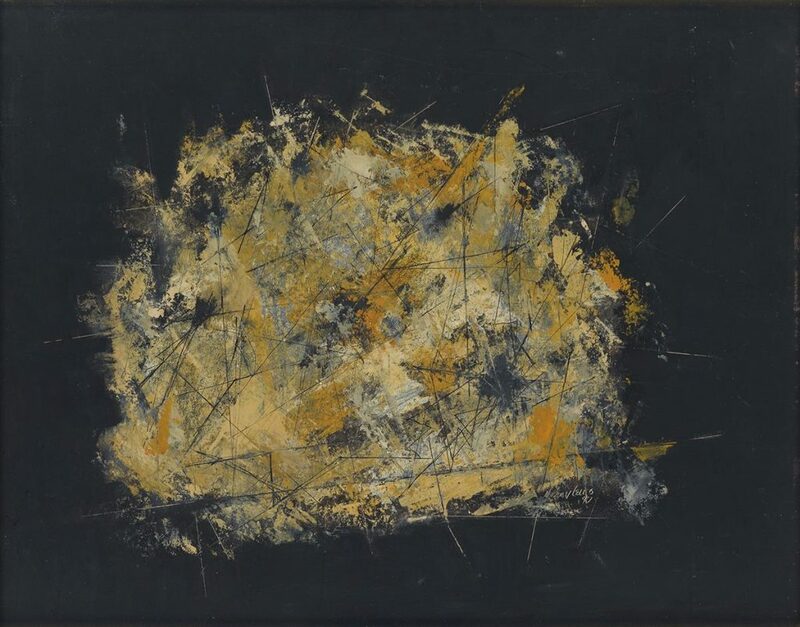 Also of note by Lewis, an early oil on masonite board from 1947, Shapes, sold for $70,000, and Blue Moon, a 1960 oil on paper based on the phases of the moon, at $62,500. Every work by Lewis found a buyer, almost universally surpassing their high estimate. 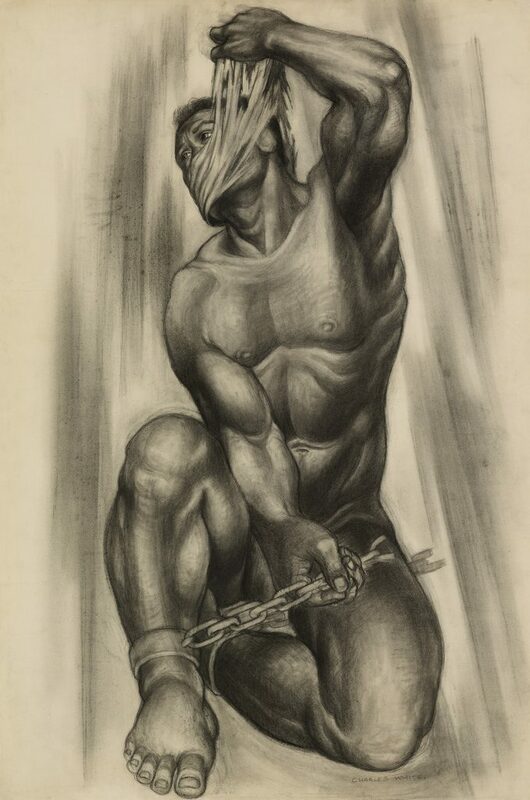 Lot 35: Charles White, Caliban, charcoal with crayon, circa 1950. Sold for $221,000. Works on paper included Charles White’s Caliban, a circa 1950 charcoal drawing of Shakespeare’s character in The Tempest, ($221,000). 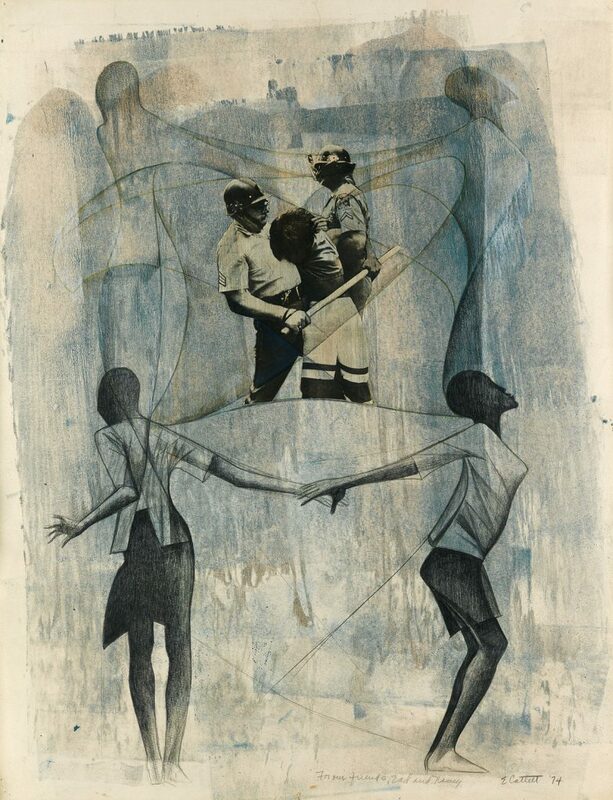 Lot 102: Elizabeth Catlett, Unititled (Civil Rights Protest), mixed media on paper, 1974. Sold for $118,750. Elizabeth Catlett’s 1974 experimental multimedia work Untitled (Civil Rights Protest) ($118,750); the collage Early Morning, 1968-69, by Romare Bearden ($185,000); and Psychic Fragments #3, 1988, mixed media with watercolor and ink, by Jack Whitten ($55,000). 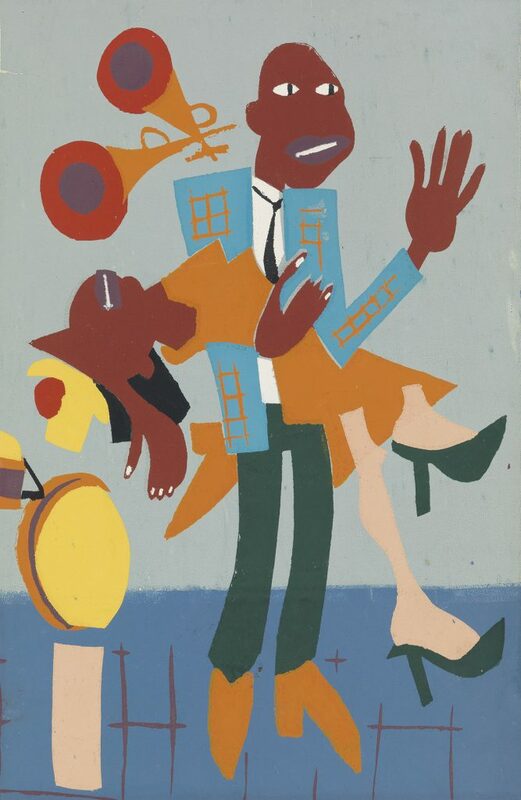 Lot 24: William H. Johnson, Jitterbugs V, color screenprint, circa 1941-42. Sold for $118,750. William H. Johnson’s circa 1941-42 color screenprint Jitterbugs V made its auction debut at $118,750, tying the previous record for the artist. 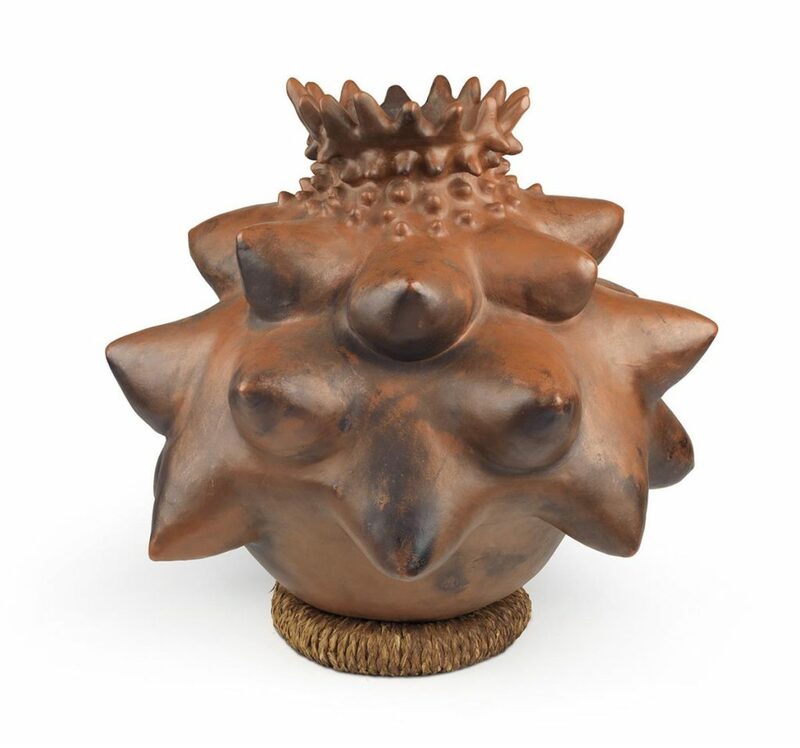 Lot 5: August Savage, Gamin, plaster painted dark brown, circa 1929. Sold for $68,750. 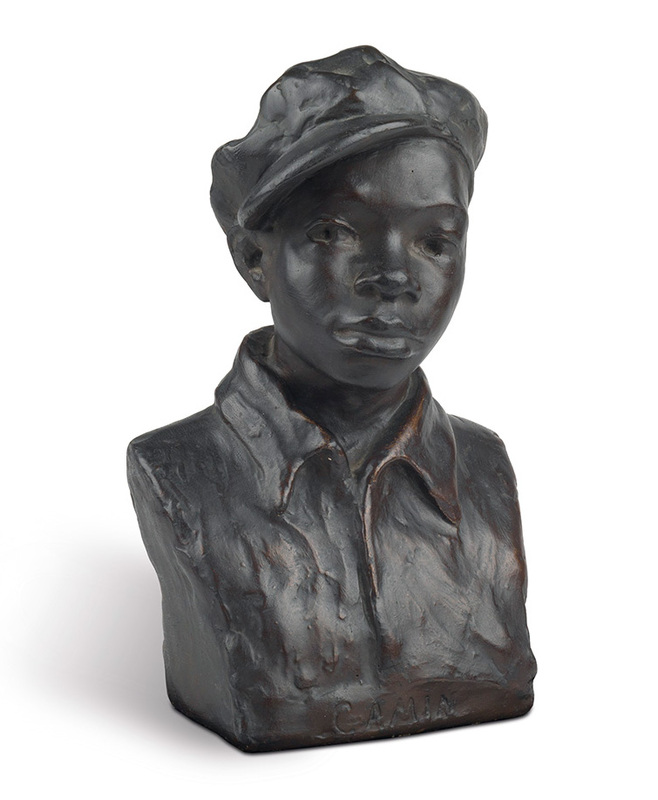 Augusta Savage’s sculpture in plaster Gamin, circa 1929, matched the artist’s standing record at $68,750. A portfolio of 18 silver and sepia-toned prints by James VanDerZee sold for $52,500. Lot 112: Kermit Oliver, Dusk, acrylic on board, 1972. Sold for $112,500, a record for the artist. Kermit Oliver’s Dusk, acrylic on board, 1972, brought a record for the artist at $112,500. Additional artist records included Walter Sanford, Charles McGee, Freddie Styles, Peter Bradley, Robert James Reed, Jr. and Victor Seach. Lot 164: Mary Lovelace O’Neal, Running Freed More Slaves Than Lincoln Ever Did, oil & mixed media on canvas, 1995. Sold for $40,000, a record for the artist. 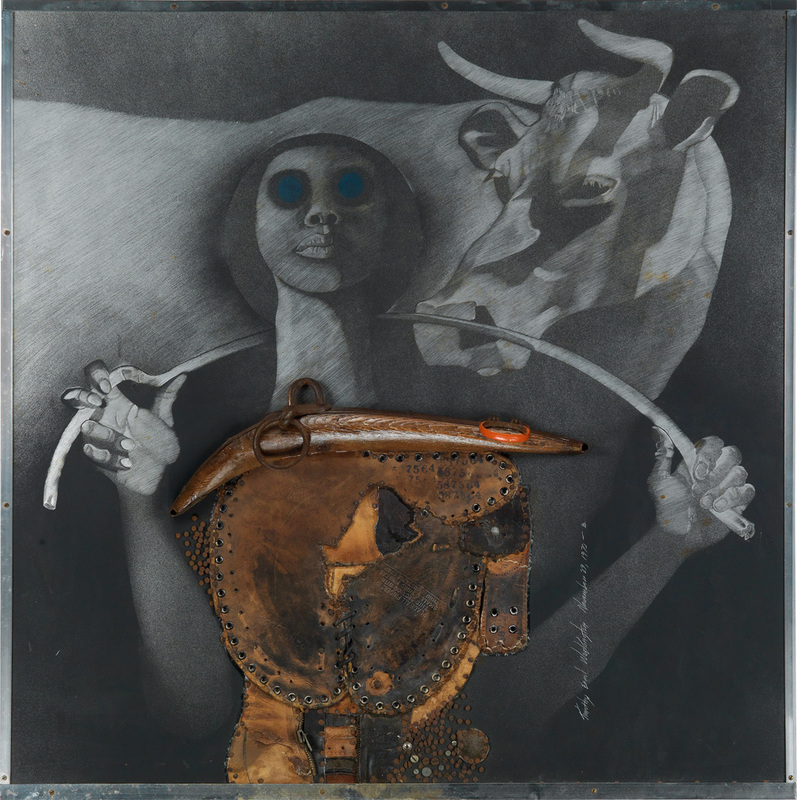 Mary Lovelace O’Neal’s Running Freed More Slaves Than Lincoln Ever Did, oil and mixed media, 1995, sold for $40,000, the first significant work by the artist to come to auction. Other debuts included Sonya Clark’s 2013 sculptural work in cotton thread and combs, Albers #1 ($9,100).